written by camp directors for camp ministry, with topics relevant to all areas of camp life—for counselors, support staff, administrative staff, and directors. 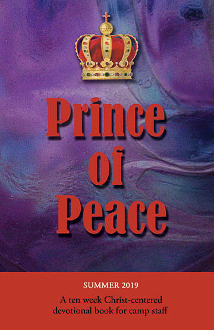 you'll find a feature we call Leaders of the Faiith—we present a brief summary of a faithful follower of the Prince of Peace along with some reflection thoughs applicable to camp life. focuses on Romans 5, highlighting God's love and grace for staff memberrs. Every devotion is undated, so you can start at any time. And if your camp is shorter than ten weeks, your staff can continue using the devotional book when they go home.